For the first 47 editions of the race, the race started on Italian soil. In 1965 the race made its first foreign start in San Marino, and has since had twelve more foreign starts. The 2018 start in Jerusalem, Israel was met with controversy as activists (described as both "human rights activists" and "anti-Israel activists") called for the race to be moved, claiming that the race whitewashes Israel's allegedly poor human rights record. 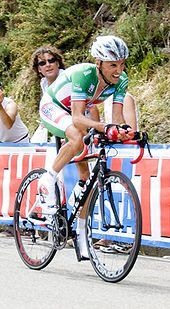 Ultimately, the race went ahead as scheduled and every team selected for the Giro took part, including two teams of Arabic ownership; the Bahrain-Mérida team and the United Arab Emirates team. ^ a b c d e f g h i "Tour de France: Time Trials, Mountains Stages, Prologues, and More – For Dummies". Dummies.com. 2008-11-07. Retrieved 6 August 2012. ^ "Giro d'Italia, oggi il via a Gerusalemme: crono a pochi metri dal Santo Sepolcro". Il Messaggero. May 3, 2018. Retrieved April 11, 2019. 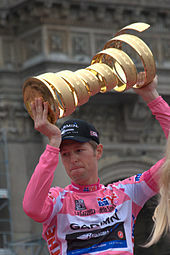 ^ "Giro d'Italia to start in Budapest in 2020". 2WheelsToday. Retrieved April 15, 2019.